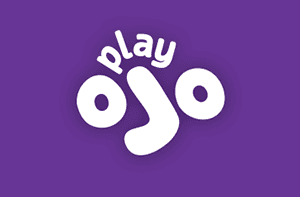 Another game based on Ancient Egypt? Yep, another game based on Ancient Egypt. 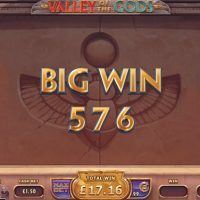 Greek Gods and Ancient Egypt; they must be the two most popular backdrops for slot games right now in the world of online casino. 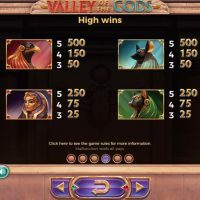 Book of Dead and Cleopatra are two of the better ones, but does Valley of the Gods stand up to the test set out by the two behemoths of the genre? Ehhhm, kinda. 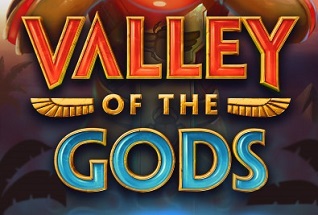 Yggdrasil make some fantastic games, and usually, the visuals are top notch, but I just feel like they’re a little bit flat and bland on Valley of the Gods, but if you compared it to Cleopatra, this would definitely take the win. Book of Dead though? Not so much. 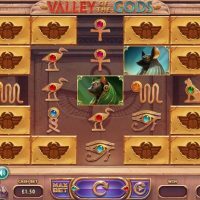 But whereas Book of Dead and Cleopatra are classic 5 reels, 10/20 payline games, Valley of the Gods is a little bit different, offering over 3,125 pay lines on a 5 reel slot. You don’t always have the full play area though, there are static blocks hanging over some of the symbols which are removed when you hit a line. 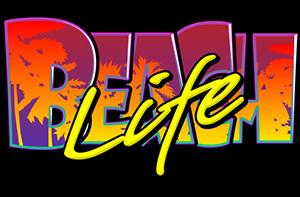 The symbols as you’d expect are all related to Ancient Egyptian culture. The best symbol to hit is the Egyptian falcon which pays out 500/1 should you hit five in a row. 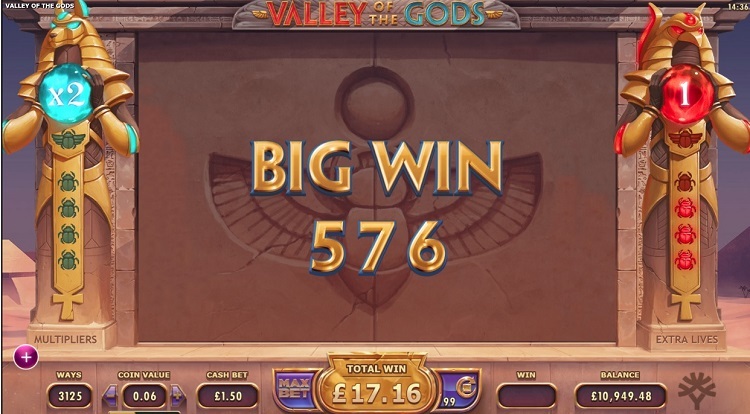 There is no bonus round on Valley of the Gods, but you do get a free re-spin every time you hit a line, and when you clear the game area you start to get multipliers added to your wins. Lovely lovely. 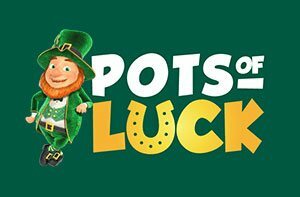 You can’t bet on different lines, but you can bet between 10p and £100 per spin. The house edge is a decent 3.8%. 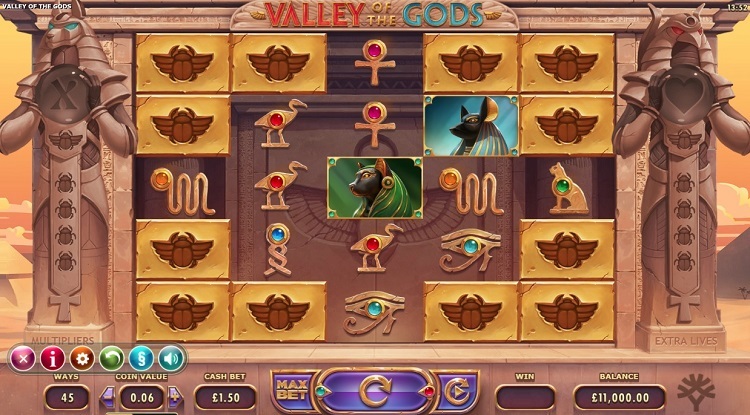 I tell you what, when I first landed on this game I thought it was going to be about the sandstone valley in Utah called Valley of the Gods, so when the Egyptians came up, I was slightly befuddled. There is a Valley of the Kings by the River Nile in Egypt, though. Do you think they just titled it wrong? But hey, don’t let that distract you from this great game. 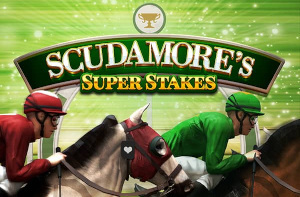 If you’re looking for a game a game that’s a little bit quirky, and a little bit different which is complemented with great visuals, then you have a great option right here. 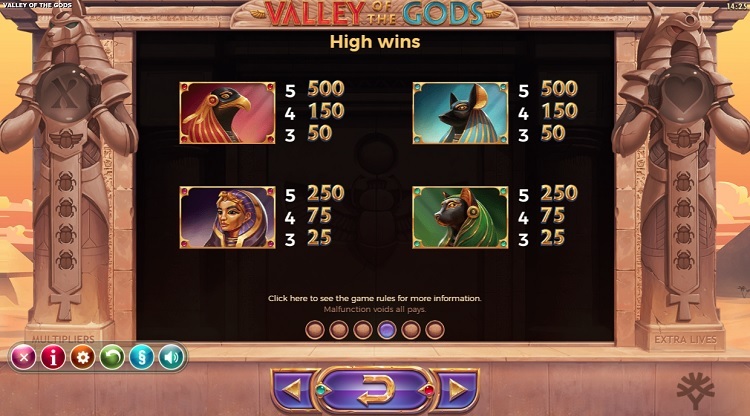 Valley of the Gods does everything well, and though it probably doesn’t quite beat Book of Dead to the top of the Ancient Egyptian slot game table, it is a very close second.